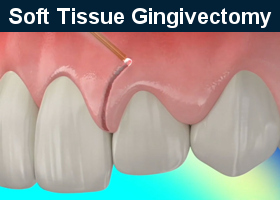 Gingivectomy is an operation that is performed on soft gum tissues for removal of excess, non-viable material and elimination of dentogingival pathological pockets. The operation is performed to relieve inflammation in the periodontal tissues and prevent its spread to the bone structures. Gum excision reduces periodontal pockets. The operation has a curative and aesthetic effect. It removes inflammation and makes the gingival contour more attractive. After removing excess gums and lengthening the crown, the patient’s teeth appearance improves significantly. The formation of periodontal pockets leads to an increase in the space released by the destruction of the periodontal tissues. Their appearance causes bad breath, bleeding gums, discomfort during meals, development of inflammatory processes and pathogenic microflora in the oral cavity. The result of untimely medical help is the loss of healthy teeth. Dr. Sahakyan at My Dentist Burbank successfully solves the problem of the formation of periodontal pockets and conducts gingivectomy at a high professional level. By gingivectomy is understood the operation performed on the tissues of the free or attached gingiva in the presence of true dentogingival pockets. The essence of the procedure is that, under local anesthesia, the doctor excludes a part of soft tissues that do not allow for good hygiene of the oral cavity and contribute to the accumulation of dental deposits in the cavity between the free gum and the root surface. 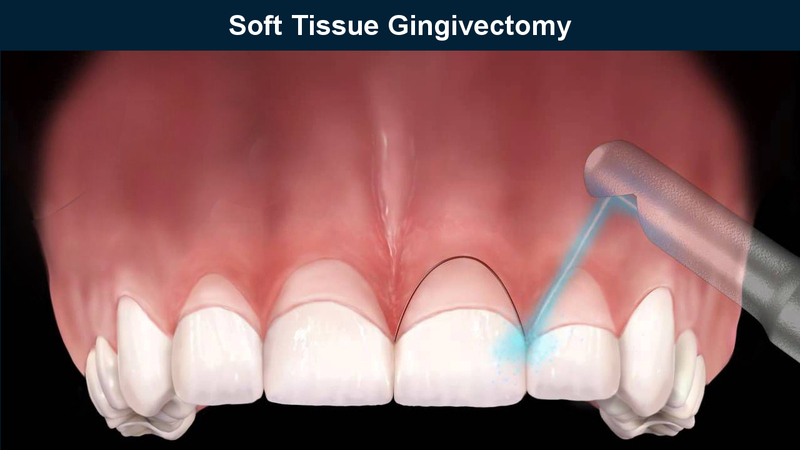 One of the main requirements for gingivectomy is the presence of a sufficient amount of loose edge of the gum, which should be preserved after complete excision of the pathological pocket to its full depth. Such a procedure is unacceptable if there is a destruction of the alveolar bone. After excision of excess gingival tissue, the tooth will lose its attachment, its mobility will arise, which can lead to a tooth loss. Before the beginning of the operation, the Burbanks dentist must determine the exact depth of the periodontal pocket. If the cavity in the periodontal space is left unchanged, then later, the remains of food and saliva will inevitably accumulate in them. This will necessarily lead to suppuration, inflammation, and relapse of the disease. You can indefinitely go to the dentists so that they make a permanent cleaning of existing pockets, but the problem will not be solved. The only reliable and radical method is gingivectomy – excision (surgical removal) of existing cavities. As a result, the edges of the gums will again fit snugly to the tooth. There will be no cavities, there will be no food to accumulate, and the problem will be finally solved. Without appropriate indications, gingivectomy cannot be performed, since it is a surgical intervention that requires the presence of certain pathological conditions. The list of indications includes various diseases of the gums. The list includes diseases which cause significant deformation of the soft tissues, which makes them unviable and unable to perform their basic functions. In severe forms of gingivitis and periodontitis, dentogingival pockets are formed which help maintain inflammation in the gum. Those pockets also serve as a reservoir for the accumulation of pathogenic micro flora. Bacteria are not only a constant source of infection in the oral cavity but also lead to the progression of inflammation of the soft tissues and the transition of the process to bone structures. This over time can lead to tooth loss. 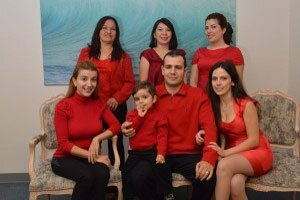 Dr. Sahakyan at My Dentist Burbank will perform a thorough examination, promptly identify any problems and suggest options to deal with them effectively. What Determines the Choice of Gingivectomy? the general condition of the body and the immune system. Gingivectomy is usually used in the complex treatment of periodontal diseases. The performed excavation and excision of free part of the gingiva make the following possible. The best dentist in Burbank gets to the bottom of the periodontal pocket. Then he removes all deposits from it and polishes the surface of the root. Manipulation is carried out under local anesthesia, after which the excision of the part of the gums with a scalpel or laser is performed. Preparation is necessary, before any kind of gingivectomy. Before the operation, it is important to perform a professional tooth cleaning. In this case, the Burbank dentist, with the help of special attachments, removes the remains of food from the teeth, plaque, or removes dental calculus. These components will feed the putrefactive microflora if they are not removed from the mouth. The next step is the introduction of local anesthetic into the affected gums. Only then the dentist starts the operation. The dentist cuts the gum to the depth of the canal, exposing the root of the tooth. From the pocket, he removes tartar and other foreign particles. 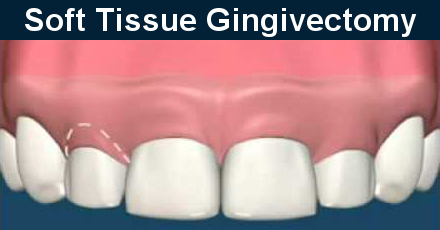 The enlarged gingival tissue is then cut off. When all of the diseased tissue is removed, the dentist sometimes puts a temporary putty over the gums. This substance is designed to protect gums while they heal. 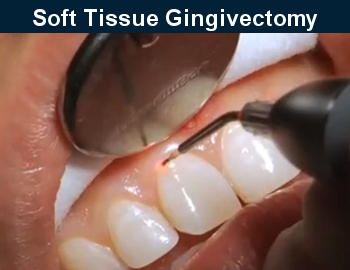 Gingivectomy incisions are made with a laser. The use of a laser for gingivectomy is highly desirable for many reasons. This is currently the most advanced technology. It allows you to avoid getting into the wound infection and the development of most postoperative complications. Laser surgery is carried out without contact, which minimally damages the tissue. When a focused laser beam is used, the microflora of the mouth is neutralized, as a result of which the edges of the wound do not lose sterility. To ensure that your smile is always snow-white, and the use of food is only a pleasure, please contact the best dentist in Burbank, Dr. Sahakyan, at My Dentist Burbank. If successful, the rehabilitation period after gingivectomy, is short-lived and proceeds easily and without complications. But this happens only on the condition that the patient implicitly follows the prescription of the dentist. After following all the recommendations for a few days the patient will be able to return to the usual way of life. Until the complete restoration of tissues, it is necessary to exclude from the diet any foods and dishes that are capable of exerting an irritating and damaging effect on the gum. These include acidic, salty, spicy dishes, as well as excessively solid foods. All the food that a person consumes should be slightly warm, since hot food can lead to the development of bleeding. Drinks should also not cause discomfort in the oral cavity. It is unacceptable to drink alcohol throughout the rehabilitation period. Try to give up smoking during the restoration of tissues. Limited chewing loads are recommended. It is necessary to observe hygiene of teeth and gums in order to avoid attachment of infection and suppuration of the wound. A soft toothbrush needs to be used so it does not injure the injured gum. To find out all the details and make an appointment for a consultation with Dr. Sahakyan the best dentist Burbank, please call 1-818-578-2324 for an appointment today.